Season five of Fortnite: Battle Royale is starting to get a bit more interesting. Yesterday, a giant purple cube appeared in-game. The mysterious cube spawned in the location of a lightning strike in Paradise Palms. But now, it appears that the cube is on the move. It almost looks like the cube is starting to slowly flip down the cliff that it originally spawned on top of. and it gives you shield if you stand near it. 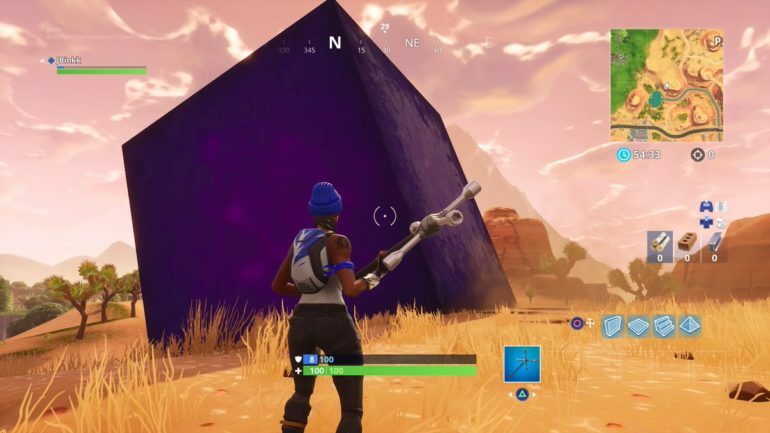 Flashing symbols and noises have also been noticed coming from the cube. And if you shoot the cube too much, it’ll kill you. It seems like this cube will play a major role in whatever mysterious event Epic Games has planned for season five in Fortnite. We’ll update this article if we learn more information about the cube’s movement. Update Aug. 26 8:58am CT: Throughout the night, the giant purple cube continued to move and it flipped seven more times, according to @FortniteBR. FortniteBR also tweeted that the cube is moving every hour and 43 minutes. The cube’s final destination still remains to be determined.